Which payment processor do you accept? We accept Only PAYPAL as of now, We DO NOT accept E-gold/Moneybookers/Liberty Reserve/Alertpay Or any other payment processor. Yes, you can pay using your Visa/Mastercard via paypal. What is the Minimum and Maximum Amount? The minimum is Rs 100 and the maximum is Rs 6,000 for a single recharge. Yes, you can do any amount recharges like Rs 99 , Rs 333 etc, Price would be adjusted accordingly. How long does it takes for the mobile or DTH to be recharged after I send the money? If everything is working normal, it will take around 1 - 5 Minutes Usually or 12 Hrs Maximum if we are offline or any other technical problem from the mobile/dth operator. Which Mobile Companies do you support? 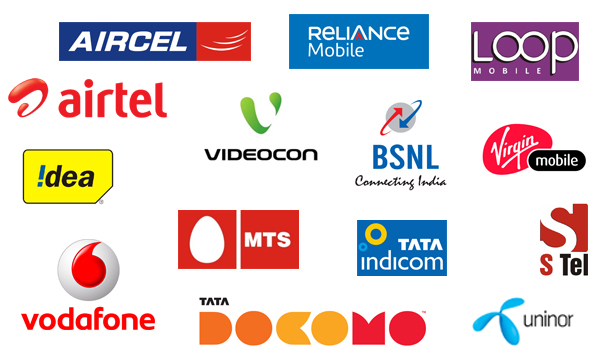 We currently support, Idea, Airtel, Vodafone, BSNL, Reliance Jio. Which DTH Companies do you support? We currently support TATA SKY, DISH TV, AIRTEL DIGITAL TV, RELIANCE BIG TV, VIDEOCON DTH, SUNDIRECT. I live Overseas, Can i recharge my friend's/relative's Mobile/DTH living in India? How will i get notified that the mobile/dth recharge is done? We will send you an e-mail immediately when we will recharge your mobile/dth or via chat. Why is my number on the blacklist? This is because you probably have sent the payment through a hacked paypal a/c or credit card, and hence we have refunded all those payments and put your number on blacklist. Do you give any discount on bulk recharges? I got a question which is not answered here? Please Contact Us and we will answer you as soon as possible.